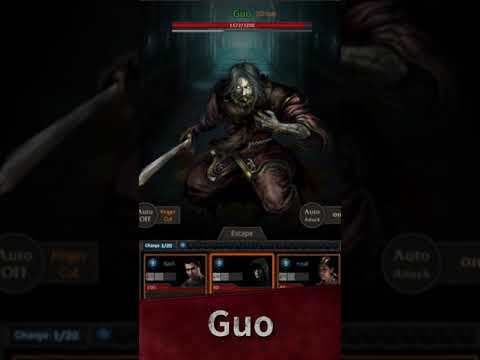 【Overview】Experience the thrill, indulgence and bizarreness on playing tomb-raiding game.Down to the ancient tombs filled with puzzles and hidden paths, venture on with limited supplies, intuition, terror and courage.Inside the coffin, there might be a treasure, or a monster, shall you fight or escape?Along with the deadly puzzles, how far you can reach? When death befalls, what will you take in emergency?Always remember, ghosts love darkness and flesh, abort wisely before the torch burns out.【Background】Ancient Three Sovereigns had achieved immortality for their unrivaled success and accomplishments. Later generations intended to find out the immortal secret but were all of no avail. Only the Southern King Liu An of Han dynasty, who had explored countless mountains and caves, has revealed the secret and achieved immortality, and left the Immortality Seal in Mundane World.A thousand years later, Lu Feng and et al., at the behest of someone, treaded on to seek for the Immortality Seal with the Broken Map of Huainan. However, roaring waves of Qi River reduced their ship and set them apart. And Lu Fend, who was in not know, has been involved in a conspiracy planned by the Southern King over a thousand years.【Game Features】***Immersive Gaming–Have you heard the echoes in distance?Down to the tomb, open the coffins, with queer echoes around, what are buried under? Evil ghosts or unknown treasures?Food’s low, torch’s out, watch out! Haunted ghosts are everywhere, waiting for their chances to devour you down!Look, the ancient ghosts are laughing at you: ah, another pathetic creature craving for immortality.This is an adventure of terror and maze, a test for the bold. Dare or not? ***Deadly Puzzles–Solve the Puzzle, Race with TimeDivine Beasts Puzzle in Heaven Palace, Night Provinces and Five Mountains Chain Traps, Puzzle Plates, Mirror Maze, you name it.Inside the labyrinthine cavern, surrounding with traps, chasing by monsters, will you take the challenges？Follow the clues, racking your brains, keep exploring! Find out the hidden Truth! ***Uncover the Unknown–Witness the Changes of dynastiesWhat’s the secret of the Three Sovereigns that had achieved immortality? What’s the conspiracy concealed behind the Immortality Seal?And how did the Southern King Liu An achieve in immortality?What’s happened thousand years ago between beauty Daji, First Emperor of Qin and the great strategist Jinke?Now, here’s the chance, witness the changes of dynasties and reveal the unknown histories on your own! ***Unexpected Turns–Every choice leads to different ends.Wine presented by a beauty, will you drink it?Millennial corpse, with raging resentments, will you fight or escape?Helpless stranger, will you save him or just turn away?Every step leads to different ends, standing at the edge of death, think wisely! ***Considerate Plan–What will you take? Food, Torch or Touching Gold Rune?In a society of exchange, how to take a high bargain with black dealers?Supplies are limited, who will be your loyal and reliable partner?Dazzling treasures or food for survival, what will you take?Know this: Only men who can expect and prepare for the unknown will survive.【SOPPORT】 Any problem while enjoying game? You could visit https://www.facebook.com/Tomb-Survivor-1886392758124501/ or reach us through “Setting” >”Consumer Service” in game.【Community】Facebook Group: https://www.facebook.com/groups/csjgroup/Discord: https://discordapp.com/invite/xBdzXKjWe need the below access:GET_ACCOUNTS Players could use Google Accounts to login in game. 1. Fixed a login issue where message “Failed to acquire user info, please login again.” pops up.2. Fixed a bug where Change Saved Data is not functional. 1. Fixed a login issue where message "Failed to acquire user info, please login again." pops up.2. Fixed a bug where Change Saved Data is not functional.